Twenty-two BSc Economics alumni of Queen’s University gathered in the Malone Lodge Hotel in Belfast on Saturday 13 October to celebrate the 30th anniversary of their graduation. 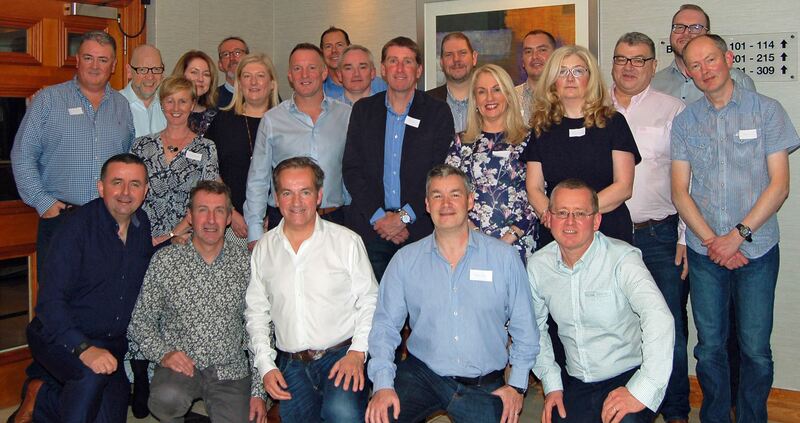 The number represented just over half of the original class of 40 from 1985-88, with participants coming from Dublin, England and from as far away as Seattle in the USA to attend the event. Reunion organiser Conor Mackle (pictured left, front row), who spent over 35 years working in First Trust Bank, said it was a great occasion. “We all enjoyed a really superb evening reminiscing about life at Queen’s all those years ago. “It’s wonderful to see how the years just roll away when former classmates meet up again. It was great to catch up with so many people who hadn’t met – or even spoken to each other – since the 1980s. Over drinks and dinner, the Class of 1988 had time to reminisce about the windowless reading room at the top of the now Peter Froggatt Centre, the constant noise of military helicopters, morning coffee in the Great Hall and bacon butties in the Students' Union Snack Bar, and the Economics Society formal in 1988 which was held in the nearby Wellington Park Hotel - the Welly! Among teaching staff fondly remembered were: Boyd Black, Jim Bradley, Peter Enderwick, Victor Hewitt, Clifford Jefferson, Michael McGurnaghan, Jacob Moreh, John Simpson, John Spencer and Janet Trewsdale. Members of the Class of 1988 are now working in companies and organisations such as Almac, the BBC, Dale Farm, Diamond Corrugated Cases Ltd., Lisburn & Castlereagh Council, Marlborough Place Financial Advisors, Microsoft, the NI Civil Service, Pump Services Ltd., the Royal Ulster Agricultural Society, Shorts/Bombardier, or are in the banking, insurance, accountancy or education sectors, or are self-employed. Commenting on his digs in the '80s, one participant (who wanted to remain nameless) said: "Accommodation in Belfast is much better now. I lived in the same flat for 6 years and it was a real dump! It had no central heating nor functioning shower as I recall; it simply would not reach the required standards nowadays." And in July, Richard Branson and Per Lindstrand became the first people to complete a transatlantic flight in a hot air balloon, first touching down in Northern Ireland. And the Australian soap opera Home and Away premiered! Among those unable to attend the event were: Estella Dorrian, Damian Houston, Siobhan Kelly (nee Toner), John McKinstry, Philip Moore, Joan Sheridan (nee McGinniss), Colin Stevenson and Tommy Stewart. Advice and guidance on organising class reunions can be found on the Development and Alumni Relations Office website or by contacting Alumni Relations Officer, Natasha Sharma.